paul gregutt's washington wine blog – unfined & unfiltered: forget cork soakers – how about cork sniffers? forget cork soakers – how about cork sniffers? A recent New Yorker article (“Beware of the Dogs”) profiled the training of canines used for crime prevention in the city. The superior sniffing abilities of the trained dogs were focused on ferreting out bombs, but the article points out that more than $20 Billion has been spent searching out explosives in Iraq and Afghanistan since 1996, with a 50% success rate. When the military began using dogs in place of machines, the rate jumped to 80%. 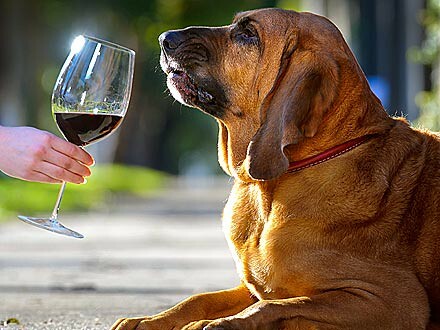 Here’s a quote from a trainer: “a dog sniffs the air like a wine taster.” Hmmm. That gave me an idea. If dogs can be trained to sniff for bombs, why not train them to sniff for TCA? Wouldn’t it make sense to have highly-trained dogs at all the major cork suppliers, for example? I’d imagine that a well-trained dog could go through a lot of corks and pull out the suspect ones pretty easily. An enterprising dog trainer could also rent out a dog for a day, giving it the opportunity to visit a winery and give all the rinsed-out barrels and unused corks a good sniff. Why not? Is anyone already doing this? According to the New Yorker story, dogs are already being trained to sniff for a wide variety of things besides bombs and drugs. They can find specific diseases, certain kinds of destructive bugs, and truffles for instance! So why not TCA? Congratulations are in order for Paul Beveridge and the members of Family Wineries of Washington State. A four-year effort to get a bill passed that dramatically reduces the paperwork for small wineries has finally been rewarded. Yesterday’s signing of SB 5259/HB 1373 will substantially reduce the tax reporting requirements of small wineries. All wineries selling less than 6,000 gallons of wine per year in the state of Washington will have the option of reporting and paying their state liquor taxes annually rather than monthly. “When you consider that 65% of Washington’s 700-plus wineries produce less than one thousand gallons of wine per year, it’s obvious that this bill will significantly reduce paperwork for a large number of people,” says Beveridge. What if the dog is wet? We do have a TCA sniffing dog - Ziggy! Here's a link to an article about her and her cork sniffing talent. Yes, Ziggy has been at it for years! My corgi, Puck, loves to chew on corks. The more tannic, the better, and he refuses to touch any tainted by TCA. It makes sense, his sense of smell is really superior to humans. Years ago, when I used tree bark as part of my wine packaging, I asked my cork supplier why they didn't use dogs to sniff out TCA. He said they tried it, but the dogs found it in ALL the cork. So much for weeding out the bad...no product left to sell! Peter - is that why you switched to glass seals? I switched away from cork because I could no longer stand having packaging ruin so much of my product! Glass is just the best closure I've seen so far, though I use and have no trouble with screwcaps. This sounds like a great way to put all those winery dogs to work! Thanks Paul! Family Wineries of Washington State has many more ideas to give Washington "The best LEGAL climate for wine!" We will keep working! We’ve already got a pack full of trained sensory experts at Nomacorc, plus our closures are TCA-free www.nomacorc.com. No dogs needed here!